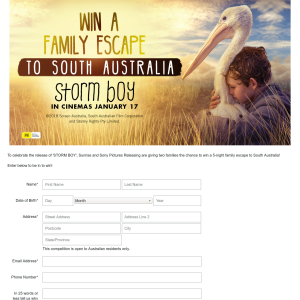 To celebrate the release of 'STORM BOY', Sunrise and Sony Pictures Releasing are giving two families the chance to win a 5-night family escape to South Australia! Enter below to be in to win! Seven and affiliate broadcasting signals are received. Releasing Pty Limited and their associated agencies and companies are not eligible to enter. January 2019 at 11.59pm (AEDT) (“the Competition Period”). fewer and submit their entry. 3.3 Entries must be received by Wednesday 16 January 2019 at 11.59pm (AEDT). 3.4 Winner must be eighteen (18) years of age or older. 3.5 Entries are limited to one entry per person per email address. Multiple entries will not be accepted. (b) free from any claims, including but not restricted to copyright or trademark claims, by other parties. • Mr. Percival Adelaide Zoo Experience. TOTAL INDIVIDUAL PRIZE VALUE: AUD$11,148.40. ultimate date on which the prize is taken. payable on insurance claims, extended travel dates, passports and visas (if applicable). 4.3 Prize is valid for six (6) months from date of winner notification. 4.4 Package is based on four (4) people sharing one (1) cabin. together and depart from and return to the same departure point. prize does not include the cost the winner may incur to travel to the airport including any ancillary costs (eg. with any travel loyalty programs. Prizes cannot be used in conjunction with travel discounts or special offers. the booking may incur a cancellation or amendment fee, at the cost and responsibility of the winner. 4.11 Travel must be completed within six (6) months of winner notification. 4.15 Dates of travel must be confirmed within forty five (45) days of winner notification. 4.17 The winner and their companions are not entitled to request a class upgrade using Frequent Flyer points. (Conditions of Carriage), accommodation provider, transport provider, services provider, transfers provider. as a result (including accommodation costs) will be the responsibility of the Winner. companions miss their outbound or return flights or fail to meet any check in requirements for any reason. 4.22 Mega Adventure Park minimum age is seven (7) years of age. SKYCHALLENGE minimum height: 120cm. MEGABOUNCE Weight: 10kg - 90kg. All passenger heights and weight must be advised at time of booking. September), Saturday (October to April). child car seat(s), GPS navigation, and other applicable items. keeper prepare the food and feed the Pelicans. Additional terms may apply. forfeited and not redeemable for cash. prize winner will be notified accordingly. There will be no cash alternative. booking. No changes are permitted to travel arrangements once tickets are issued. 4.31 Individual supplier terms and conditions apply. residence to their nearest Capital City Airport in Australia. These conditions apply for all flights. 4.33 Airline, flight route and dates of travel are subject to the promoter’s absolute and final decision. 4.35 It is the responsibility of the winner to enquire about local issues and conditions at destinations before travel. 4.36 No refund or exchange on any passes except as required by law and as otherwise specified by the seller. 5.1 There will be two (2) winners of the Competition. accordance with clause 3 (“Qualifying Entrant”) will be entered into the Competition. 5.4 Winners will be notified by telephone within two (2) business days of the judging. 5.5 The judges’ decision is final and the Promoter will not enter into correspondence regarding the result. 5.6 Incomprehensible and illegible entries will be deemed invalid. provide the stated prize, the Promoter reserves the right to award a substitute prize. Sponsor’s legal rights to recover damages or other compensation from such an offender are reserved. terminate, modify or suspend the competition.